When we think of mistletoes, we generally think about those epiphytic parasites living on branches way up in the canopy. The mistletoe we are discussing in this post, however, is a decent sized tree. Nuytsia floribunda is a native of western Australia where it is known locally as moojar or the Christmas tree. To the best of our knowledge, it is the largest mistletoe known to science. Nuytsia floribunda is a member of the so-called showy mistletoe family (Loranthaceae). It along with all of its mistletoe cousins reside in the order Santalales but from a phylogenetic standpoint, the family Loranthaceae is considered sister to all other mistletoes. This has excited my botanists as it allows us a chance to better understand how parasitism may have evolved in this group as a whole. Speaking of parasitism, there are some incredible things going on with N. floribunda that are worth talking about. For starters, it is not fully parasitic but rather hemiparasitic. As you can tell by looking at the tree decked out in a full canopy of leaves, N. floribunda is entirely capable of photosynthesizing on its own. In fact, experts feel that it is fully capable of meeting all of its own carbohydrate needs. Instead, it parasitizes other plants in order to acquire water and minerals. How it manages this is remarkable to say the least. Nuytsia floribunda is a root parasite. Its own roots fan out into the surrounding soil looking for other roots to parasitize. Amazingly, exploratory roots of individual N. floribunda have been found upwards of 110 meters (360 ft.) or more away from the tree. When N. floribunda do find a suitable host root, something incredible happens. It begins to form specialized roots called “haustoria”, which to form a collar-like structure around the host’s roots. Whole haustoria of Nuytsia (white [ha]) and host root (dark brown). * indicates `gland' and developing `cutting device. The collar gradually swells and a small horn forms on the inside of the haustoria. 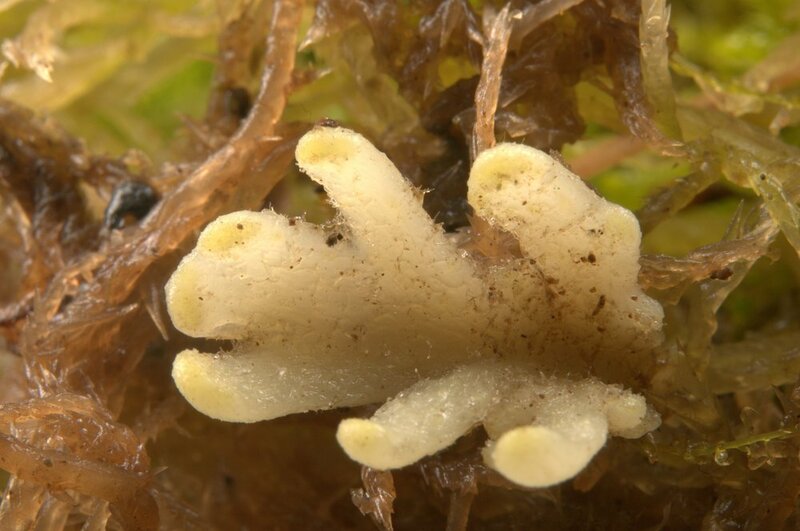 Swelling of the haustoria is the result of an influx of water and as the pressure around the host root builds, the haustorial horn of N. floribunda physically cuts into its victim. Once this cut is formed, the haustoria form balloon-like outgrowths which intrude into the xylem tissues of the host root, thus forming the connection that allows N. floribunda to start stealing the water and minerals it needs. Even more amazing is the fact that roots aren’t the only thing that N. floribunda will attempt to exploit. Many inanimate objects have been found wrapped up in a haustorial embrace including dead twigs, rocks, fertilizer granuals, and even electric cables! Its non-selective parasitic nature appears to have left it open to exploring other, albeit dead end options. I don’t want to paint the picture that this tree as the enemy of surrounding vegetation. It is worth noting that N. floribunda extracts very little from any given host so its impact is spread out among the surrounding vegetation, making its overall impact on host plants minimal most of the time. Provided its needs have been met, N. floribunda puts on one heck of a show around December. In fact, the timing of its blooms is the reason it earned the common name of Christmas tree. Flowering for this species is not a modest affair. Each tree is capable of producing multiple meter-long inflorescences decked out in sprays of bright orange to yellow flowers. The flowers themselves produce copious amounts of pollen and nectar, making it an important food source for resident pollinators. Though many different species have been documented visiting the flowers, it is thought that beetles and wasps are the most effective at pollination. Seed dispersal for N. floribunda is mainly via wind. Each fruit is adorned with three prominent wings. After they detach from the tree, the fruits usually break apart into three samaras, each with its own wing. The key for success of any propagule is ending up in a site suitable for germination. According to some, this can be a bit tricky and attempts at cultivating this plant in captivity have not been terribly successful. It would seem that nature knows best when it comes to reproductive success in N. floribunda. It may be worth trying to figure it out though because recent evidence suggests that this species is not faring well with human development. As the surrounding landscapes of western Australia become more and more urbanized, plants like N. floribunda seem to be on the decline. Perhaps renewed interest in growing this species could change the tide for it as well as others. Extinction is a hard status to confirm for many types organisms. Whereas discovering a new species requires finding only a single individual, declaring one extinct requires knowing that there are no individuals left at all. This is especially true when organisms live cryptic lifestyles, a point recently made quite apparent by the rediscovery of a small parasitic plant known scientifically ask Thismia neptunis. 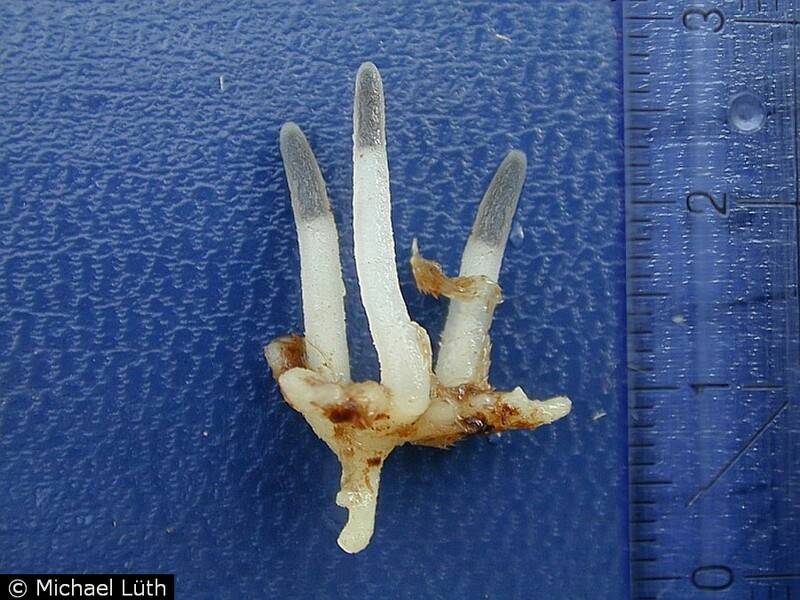 Thismia neptunis is a type of parasite called a mycoheterotroph, which means it makes its living by parasitizing mycorrhizal fungi in the soil. It obtains all of its needs in this way. As such, it produces no leaves, no chlorophyll, and really nothing that would readily identify it outright as a plant. All one would ever see of this species are its bizarre flowers that look more like a sea anemone than anything botanical. Like most mycoheterotrophs, when not in flower it lives a subterranean lifestyle. The original drawing of Thismia neptunis (from Beccari 1878). This is why finding them can be so difficult. Even when you know where they are supposed to grow, infrequent flowering events can make assessing population numbers extremely difficult. Add to this the fact that Thismia neptunis is only known from a small region of Borneo near Sarawak where it grows in the dense understory of hyperdiverse Dipterocarp forests. It was first found and described back in 1866 but was not seen again for 151 years. To be honest, it is hard to say whether or not most folks were actively searching. Regardless, after a 151 year absence, a team of botanists recently rediscovered this wonderful little parasite flowering not too far from where it was originally described. Though more study will be needed to flesh out the ecology of this tiny parasitic plant, the team was fortunate enough to witness a few tiny flies flitting around within the flower tube. It could very well be that these odd flowers are pollinated by tiny flies that frequent these shaded forest understories. As exciting as this rediscovery is, it nonetheless underscores the importance of forest conservation. The fact that no one had seen this plant in over a century speaks volumes about how little we understand the diversity of such biodiverse regions. The rate at which such forests are being cleared means that we are undoubtedly losing countless species that we don't even know exist. Forest conservation is a must. Click here to support forest conservation efforts in Borneo. Imagine a giant vine with no leaves and no chlorophyll scrambling over decaying wood and branches of a warm tropical forest. As remarkable as that may seem, that is exactly what Erythrorchis altissima is. 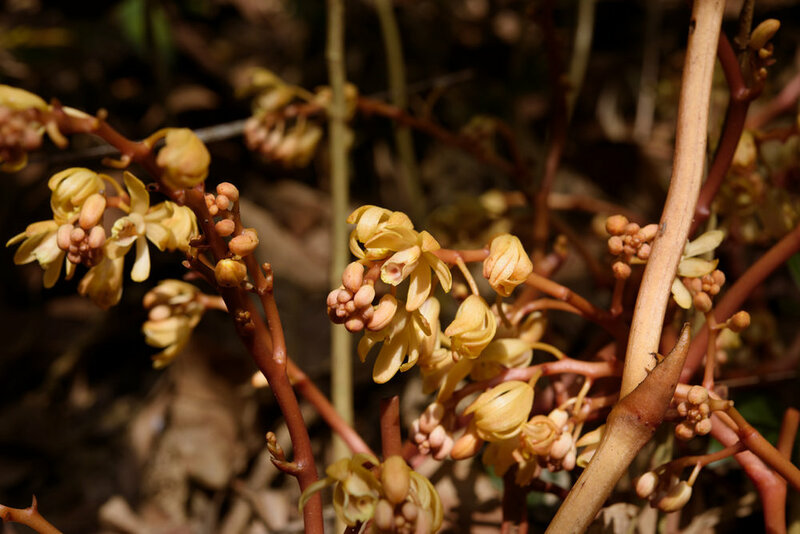 With stems that can grow to upwards of 10 meters in length, this bizarre orchid from tropical Asia is the largest mycoheterotrophic plant known to science. Mycoheterotrophs are plants that obtain all of their energy needs by parasitizing fungi. As you can probably imagine, this is an extremely indirect way for a plant to make a living. In most instances, this means the parasitic plants are stealing nutrients from the fungi that were obtained via a partnership with photosynthetic plants in the area. In other words, mycoheterotrophic plants are indirectly stealing from photosynthetic plants. In the case of E. altissima, this begs the question of where does all of the carbon needed to build a surprising amount of plant come from? Is it parasitizing the mycorrhizal network associated with its photosynthetic neighbors or is it up to something else? These are exactly the sorts of questions a team from Saga University in Japan wanted to answer. All orchids require fungal partners for germination and survival. That is one of the main reasons why orchids can be so finicky about where they will grow. Without the fungi, especially in the early years of growth, you simply don't have orchids. The first step in figuring out how this massive parasitic orchid makes its living was to identify what types of fungi it partners with. To do this, the team took root samples and isolated the fungi living within. By looking at their DNA, the team was able to identify 37 unique fungal taxa associated with this species. Most surprising was that a majority of those fungi were not considered mycorrhizal (though at least one mycorrhizal species was identified). Instead, the vast majority of the fungi associated with with this orchid are involved in wood decay. To ensure that these wood decay fungi weren't simply partnering with adult plants, the team decided to test whether or not the wood decay fungi were able to induce germination of E. altissima seeds. In vitro germination trials revealed that not only do these fungi induce seed germination in this orchid, they also fuel the early growth stages of the plant. Further tests also revealed that all of the carbon and nitrogen needs of E. altissima are met by these wood decay fungi. These results are amazing. It shows that the largest mycoheterotrophic plant we know of lives entirely off of a generalized group of fungi responsible for the breakdown of wood. By parasitizing these fungi, the orchid has gained access to one of the largest pools of carbon (and other nutrients) without having to give anything back in return. It is no wonder then that this orchid is able to reach such epic proportions without having to do any photosynthesizing of its own. What an incredible world we live in! There is something satisfying about saying "Krameria." Whereas so many scientific names act as tongue twisters, Krameria rolls of the tongue with a satisfying confidence. What's more, the 18 or so species within this genus are fascinating plants whose lifestyles are as exciting as their overall appearance. Today I would like to give you an overview of these unique parasitic plants. Commonly known as rhatany, these plants belong to the family Krameriaceae. This is a monotypic clade, containing only the genus Krameria. Historically there has been a bit of confusion as to where these plants fit on the tree of life. Throughout the years, Krameria has been placed in families like Fabaceae and Polygalaceae, however, more recent genetic work suggests it to be unique enough to warrant a family status of its own. Regardless of its taxonomic affiliation, Krameria is a wonderfully specialized genus of plants with plenty of offer the biologically curious among us. All 18 species are shrubby, though at least a couple species can sometimes barely qualify as such. They are a New World taxon with species growing native as far south as Paraguay and Chile and as far north as Kansas and Colorado. They generally inhabit dry habitats. As I briefly mentioned above, most if not all of the 18 species are parasitic in nature. They are what we call "hemiparasites" in that despite stealing from their hosts, they are nonetheless fully capable of photosynthesis. It is interesting to note that no one has yet been able to raise these plants in captivity without a host. It would seem that despite being able to photosynthesize, these plants are rather specialized parasites. That is not to say that they have evolved to live off of a specific host. Far from it actually. A wide array of potential hosts, ranging from annuals to perennials, have been identified. What I find most remarkable about their parasitic lifestyle is the undeniable advantage it gives these shrubs in hot, dry environments. Research has found that despite getting a slow start on growing in spring, the various Krameria species are capable of performing photosynthesis during extremely stressful periods and for a much longer duration than the surrounding vegetation. The reason for this has everything to do with their parasitic lifestyle. Instead of producing a long taproot to reach water reserves deep in the soil, these shrubs invest in a dense layer of lateral roots that spread out in the uppermost layers of soil seeking unsuspecting hosts. When these roots find a plant worth parasitizing, they grow around its roots and begin taking up water and nutrients from them. By doing this, Krameria are no longer limited by what water or other resources their roots can find. Instead, they have managed to tap into large reserves that would otherwise be locked away inside the tissues of their neighbors. As such, the Krameria do not have to worry about water stress in the same way that non-parasitic plants do. By far the most stunning feature of the genus Krameria are the flowers. Looking at them it is no wonder why they have been associated with legumes and milkworts. They are beautiful and complex structures with a rather specific pollination syndrome. Krameria flowers produce no nectar to speak of. Instead, they have evolved alongside a group of oil-collecting bees in the genus Centris. One distinguishing feature of Krameria flowers are a pair of waxy glands situated on each side of the ovary. These glands produce oils that female Centris bees require for reproduction. Though Centris bees are not specialized on Krameria flowers, they nonetheless visit them in high numbers. Females alight on the lip and begin scraping off oils from the glands. As they do this, they inevitably come into contact with the stamens and pistil. The female bees don't feed on these oils. Instead, they combine it with pollen and nectar from other plant species into nutrient-rich food packets that they feed to their developing larvae. 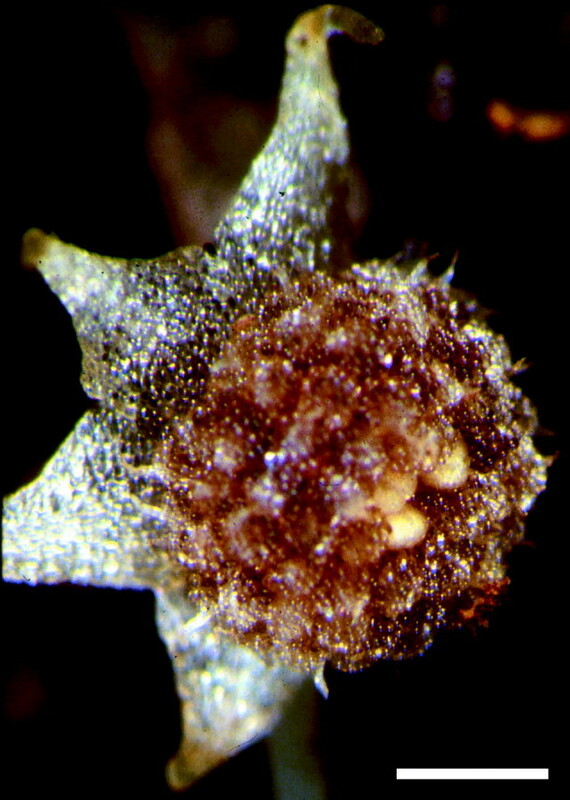 Following fertilization, seeds mature inside of spiny capsules. These capsules vary quite a bit in form and are quite useful in species identification. Each spine is usually tipped in backward-facing barbs, making them excellent hitchhikers on the fur and feathers of any animal that comes into contact with them. I have had my eye on these strange brown golf ball shaped growths growing on the twigs of a cedar in my neighborhood for about a year now. I first took notice of them late last spring. They looked pretty nasty but I knew they had to be something interesting. Indeed, interesting doesn't even come close to the reality. These odd little growths are actually a single stage in the complex life cycle of a group of fungi in the genus Gymnosporangium. Collectively they are referred to as cedar-apple galls. Its a group of fungi whose hosts include junipers and relatives of the apple. Wherever these two lineages coexist you are bound to find this fungus. Gymnosporangium have a rather interesting life cycle that includes multiple hosts. The golf ball shaped galls will appear on the twigs of a juniper nearly a year after being infected with spores. They grow in size until they reach a point in which they will barely fit in the palm of your hand. The gall itself is covered in a series of depressions, making it look quite out of place in a natural setting. After a year on the tree, the galls enter into their next stage of development. Usually triggered by the first warm rains of spring, strange gelatinous protrusions start to poke out of each depression on the gall's surface. These protrusions continue to swell until the entire gall is covered in bright orange finger-like masses. These are where the spores are produced. These spores, however, cannot infect another juniper. Instead, they need to land on the next host to complete their life cycle. If the spores land on a member of the family Rosaceae (though usually apples - genus Malus - are preferred), then the second stage of the life cycle begins. Spores can germinate on both the leaves and the fruit but instead of turning into a large brown gall, they take on a different appearance. This is what makes this fungus readily apparent as a type of rust. A patch of orange will begin to grow. Upon closer inspection one can see that the orange patch is actually a series of small cup-like structures full of spores. Come fall, the spores are ready to be dispersed by wind. With any luck, these spores will land back on a juniper tree and the cycle will start anew. Because of its propensity for apple crops, cedar-apple rust fungi are considered to be quite a pest. In a more natural setting, however, it is one of the most unique and interesting fungi you can find. It looks truly alien if you aren't already aware of its existence. A new species of orchid has been discovered on the small Japanese island of Kuroshima. Though not readily recognized as an orchid, it nonetheless resides in the tribe Epidendroideae. Although the flowers of its cousins are often quite showy, this orchid produces small brown blooms that never open. What's more, it has evolved a completely parasitic lifestyle. The discovery of this species is quite exciting. The flora of Japan has long thought to be well picked over by botanists and ecologists alike. Finding something new is a special event. The discovery was made by Suetsugu Kenji, associate professor at the Kobe University Graduate School of Science. 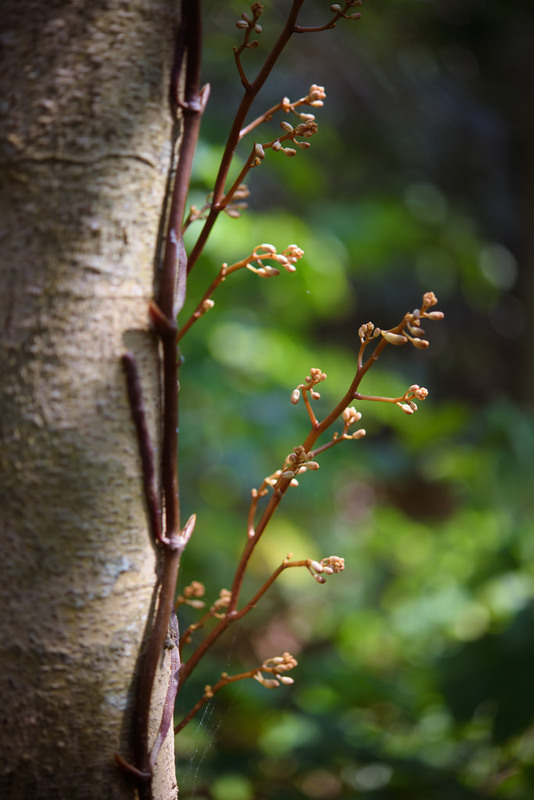 This discovery was made about a year after a previous parasitic plant discovery made on another Japanese island a mere stones throw from Kuroshima (http://bit.ly/2dYN12L). Coined Gastrodia kuroshimensis, this interesting little parasite flies in the face of what we generally think of when we think of orchids. It is small, drab, and lives out its entire life on the shaded forest floor. Like the rest of its genus, G. kuroshimensis is mycoheterotrophic. It produces no leaves or chlorophyll, living its entire life as a parasite on mycorrhizal fungi underground. This is not necessarily bizarre behavior for orchids (and plants in general). Many different species have adopted this strategy. What was surprising about its discovery is the fact that its flowers never seem to open. In botany this is called "cleistogamy." It is largely believed that cleistogamy evolved as both an energy saving and survival strategy. Instead of dumping lots of energy into producing large, showy flowers to attract pollinators, that energy can instead be used for seed production and persistence. Additionally, since the flowers never open, cross pollination cannot occur. The resulting offspring share 100% of their genes with the parent plant. Although this can be seen as a disadvantage, it can also be an advantage when conditions are tough. If the parent plant is adapted to the specific conditions in which it grows, giving 100% of its genes to its offspring means that they too will be wonderfully adapted to the conditions they are born into. As you can probably imagine, pure cleistogamy can be quite risky if conditions rapidly change. In the face of continued human pressures and rapid climate change, cleistogamy as a strategy might not be so good. That is one reason why the discovery of this bizarre little orchid is so interesting. Whereas most species that produce cleistogamous flowers also produce "normal" flowesr that open, this species seems to have given up that ability. Thus, G. kuroshimensis offers researchers a window into how and why this reproductive strategy evolved. Pollinator deception is rampant in the plant world. There are serious advantages in tricking your pollinators into thinking they are getting a reward without actually providing one. We have discussed sexual deception in the past ( ), as well as a case of food deception but a recent discovery has shed light on a new form of food deception in the flowering plant world. It is a strategy that has evolved in a distant relative of the milkweeds and it involves smelling like a dying bee. The plant in question is known scientifically as Ceropegia sandersonii. It is a vining species native to South Africa. Like the rest of the members of this genus, C. sandersonii produces bizarrely beautiful flowers that function as pitfall traps. Insects attracted to these blossoms fall down inside and remain trapped for a period of time. As they scramble around inside they inevitably pick up packets of pollen called pollinia. After about a day of imprisonment, the flowers begin to wilt, releasing the insects inside. With any luck these insects will be duped by yet another flower of the same species, and thus pollination is achieved. How this group of vines goes about attracting potential pollinators varies but, in the case of C. sandersonii, it means smelling like prey. 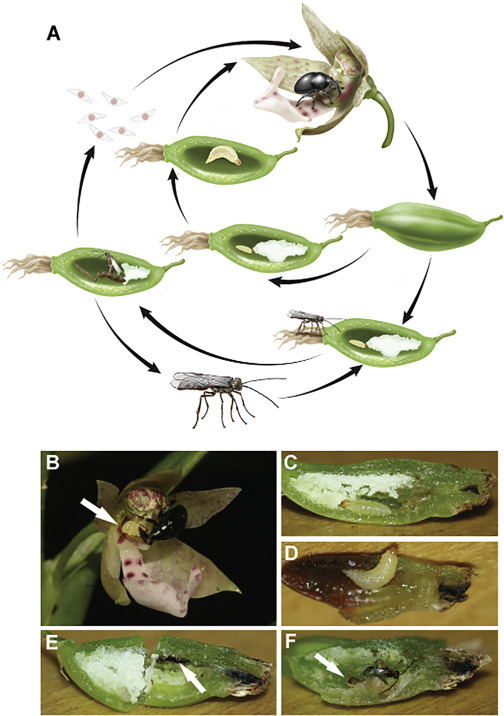 This intriguing plant requires a unique group of kleptoparasitic flies for pollination. Kleptoparasites are any species that make their living by stealing food from other organisms. The flies in question specialize on sucking the juices out of bees that have been attacked by spiders. As the spider liquefies the hapless bee, these flies sneak in and get their fill. Researchers noticed these flies were frequent visitors of C. sandersonii flowers so they decided to take a closer look at the chemicals responsible for floral scent. Their analyses revealed that the compounds released by the flowers were surprisingly similar to those released by dying bees. In fact, roughly 60% of these compounds were an exact match. Thanks to this discovery, the team hopes that closer inspection of similar flowers will reveal even more unique forms of food mimicry within this genus. To find some of the largest flowers in the world, one must find themselves hiking through the the humid jungles of southeast Asia. From there you must be lucky enough to stumble across the flowers of a genus known scientifically as Rafflesia. It contains roughly 28 species spattered about various tropical islands. If you are very lucky, you might even find Rafflesia arnoldii. Producing flowers that are over 3 feet (1 m) in diameter and weighing as much as 24 pounds (11 kg), it produces the largest individual flower on the planet. 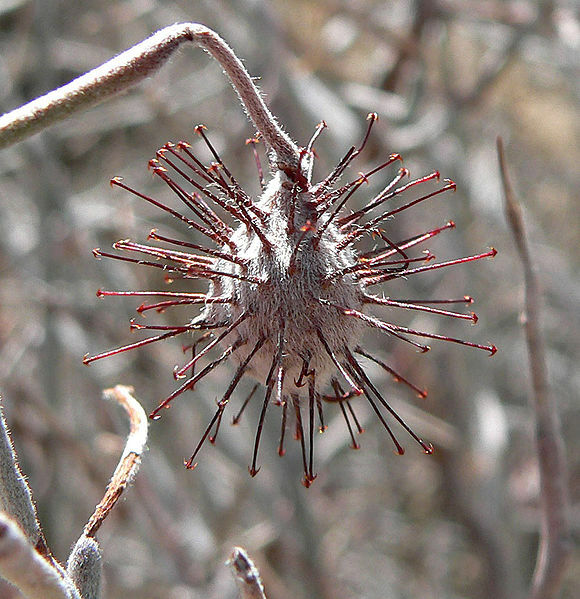 Even more bizarre, these plants are entirely parasitic. They belong to a specialized group called holoparasites. These plants produce no stems, no leaves, nor any true roots. Their entire existence depends on a group of vines related to North America's grapes. Except for flowering, individual Rafflesia exist entirely as a network of mycelium-like cells inside the tissues of their vine hosts. So, why produce such large flowers? Well, existing solely within a vine makes it hard to establish a large population in any given area. This makes for a difficult situation in the pollinator department. Somehow plants must increase the odds that any given pollinator will visit multiple unrelated individuals of that particular species. By growing very large and and producing a lot of "stink" (this plant is also referred to as the corpse plant), Rafflesia make sure that pollinators will come from far and wide to investigate, thus increasing their chances of cross pollinating. How this plant goes about seed dispersal, however, remains a mystery. Most interesting of all, it has been discovered that there is some amount of horizontal gene transfer going on between Rafflesia and its host. Basically, Rafflesia obtains strands of DNA from the vine and uses them in its own genetic code. It is believed this incurs some fitness benefit to Rafflesia but more research is needed to figure out why this may be happening. Sadly, many species within this family may be lost before we ever get a chance to get to know them. Forests throughout this region are disappearing rapidly to make room for expanding populations and agriculture. What makes matters worse for Rafflesia is that their lifestyle makes them very hard to study. It is especially difficult to obtain accurate population estimates. As more and more forests are cleared, we could be losing countless populations of these wonderful and intriguing plants. As with large mammals, it would seem that the world's largest flower is falling victim to the unending tide of human development.